Report RSS	Skyward Collapse 1.401-1.402 Beta "Bandit Suppression" and "Man The Defenses!" A couple of new beta updates following the big 1.4 beta update. They add the final new features that were to be implemented as part of 1.4, but slipped. Also, plenty of balance tweaks (specifically focusing on Bandits) and bug fixes. Skyward Collapse 1.402 Beta "Man The Defenses!" Released! This release has the remainder of the gameplay features that I'd wanted to get into the 1.4 line, but hadn't had time for before. Both of these features are heavily defensive-oriented. The second makes flowers actually useful now, by giving them the ability to add auto-heal on buildings in their towns. This again is quite useful if you're not wanting your structures destroyed (often you are). 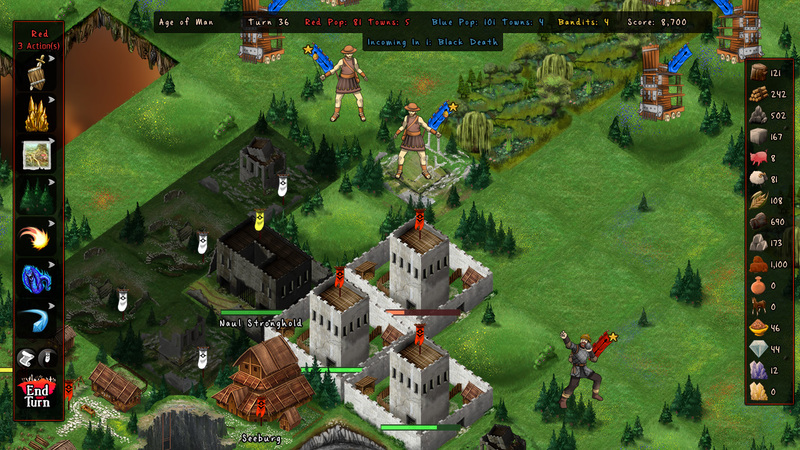 This isn't going to save you from the sorts of heavy-hitters who come over and stomp a building in one or two hits, but it will build your towns back up after they take some glancing blows, making it harder to wear down a well-defended town through accidental attrition from non-siege units. Of course, both of these compete with existing things for your resources. The upgrades compete for your currency, and the flower gardens compete for your AP and the space in your town (and, to a lesser degree, pottery; but that's easier to come by, relatively speaking).